The worst fear of those who are about to undertake a move is that they will unpack their belongings in their new home only to find that something has been broken or, worse, is missing. While there is no way to absolutely guarantee the safety and security of every item that is moved, you can be proactive in minimizing any risk by taking simple steps to prepare, pack, and load your items safely. This is especially true if you are using a portable storage or on-demand storage service. On-demand storage services save you money over traditional movers by putting most of the responsibility on you to pack and load your belongings into a portable container, which the on-demand storage company will then pick up and transport for you. The company can either simply deliver the container to your new home or can store it in another location until you need it, at which point the container will be delivered per your instructions. Because the burden is on you to pack and protect your belongings, you need to know how to safely and securely pack a portable storage container. Luckily, Honor Storage is here to help. With storage facilities all across Southern California (we have locations in Santa Barbara, Ventura and Orange County), there is really no need for you to worry. By following these simple tips, you can make sure your stuff stays safe and protected during your move. Honor Storage will help you further if you have any additional questions. 1. When packing, create an inventory of major items. If you are using more than one portable storage container, make sure you note what items go where. 2. Pack any valuable or hard-to-replace items and keep them with you during the move. Examples include personal records or legal documents such as birth certificates and social security cards, portable electronics, and prescription medications. 3. Clearly label boxes in large, dark print so that you’ll easily know what the boxes contain and what boxes goes where when unloading. 4. Don’t stuff loose items into your portable storage container. Items packed in boxes are better protected and easier to load and unload. 5. Place heavy items in smaller boxes for easier lifting, reserving larger boxes for lightweight items. - Encase your valuable artwork in picture boxes, and carefully and securely cover mirrors with bubble wrap. -	Flat-screen televisions are best secured and loaded in the original box they were delivered in. If you didn’t save that box, obtain a box that is specifically designed to fit a television, and carefully insulate the edges of the television with paper, bubble wrap, or other soft packing material. - Don’t leave empty space in boxes. When boxes are stacked, if you have a cavity in a box, it is likely to cave in, creating instability in the pile and risking everything falling over, which could spill out the contents inside. -	As a related point, use small items to fill in small or oddly-shaped spaces that inevitably appear once you’ve loaded a bigger box. -	Wrap furniture and appliances in moving blankets, which both protects the furniture from damage and stains and makes it easier to move by providing a smooth surface which can be pushed across a floor without causing any scratches or dents. -	Move mattresses in specially-designed mattress covers, which both protect the mattress and, like moving blankets for large furniture, make it easy to move the mattress around inside the house. 1. If your on-demand storage containers are going to be stored for a significant amount of time, use moisture absorbers to protect against the development of mold, mildew, or unpleasant odors inside your container. 2. Don’t put all your heavy items in one part of the container. Having a container with an imbalanced load can be hazardous, as the container can be more likely to shift suddenly and fall when it is picked up. Distribute the weight of your belongings evenly throughout the container, making sure to balance any particularly heavy items on one side of the container with items of approximately equal weight on the other. 3. As a general rule, heavy items should go on the bottom and lighter items should go on top. This is true both for individual boxes and for the portable storage container itself. 4. 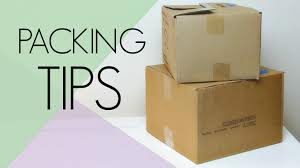 As with packing individual boxes, it is best to mix small items with big items to fill in small or oddly-shaped spaces. The contents of a container that is packed fairly tightly will be far less likely to shift during transport. 5. Tie your items down, or to each other, with ropes, moving straps, or bungee cords as you pack your portable storage container. Don’t wait until the end to do this, as you’ll only have access to the things you loaded last; do this regularly throughout the loading process. -	Make your mattress the last thing you load. As you’re loading everything into the portable storage container, leave a space directly in front of the door that is large enough to fit the mattress. Then, when you place your mattress inside the container, it will act as a large natural barrier that will help prevent objects from falling against the door in transit. This will both protect your belongings from damage due to falls and help prevent your door from jamming, which could lead to inconvenience (when you can’t open the container to get your stuff) or the need to pay for any damage to the container (depending on the terms of your contract with the on-demand storage company). -	Always lock your portable storage container when it is unattended and while it is in transit. This is both an issue of security, as a locked container cannot be easily broken into, and of safety, as a locked container generally cannot open accidentally during transport. -	If you are storing your container outside for any prolonged period of time, make sure that you take proper precautions to ensure that your belongings won’t be damaged by extreme heat or cold. Most portable storage containers have minimal insulation, and especially in summer can become very hot inside. By following these simple tips, you’ll ensure your belongings are safe, secure, and arrive in one piece. You’ll be glad you took the extra time to pack and load safely when unpacking is easier and you don’t have to deal with the time and expense involved when items are broken in transit. At Honor Storage, we provide the best portable storage solutions in the area. In addition, our services are impeccable and we take great care of all your belongings. That way, you and your family have one less thing to worry about.